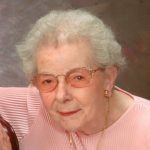 LaVonne M. Monke, 95 of Champaign, entered the arms of angels on Friday, September 7, 2018 at Heritage Healthcare, El Paso, IL. Funeral services will be at 11 a.m. on Thursday, September 13, 2018 at St. John Lutheran Church, 509 S. Mattis Ave, Champaign with Rev. Jeff Caithamer officiating. Burial will follow at 1:30 p.m. in Humbolt Cemetery, Humbolt, IL. Visitation will be from 10 to 11 a.m. prior to the funeral at the church. She was born January 1, 1923 in Mattoon, the daughter of Elmo and Bertha V. Niemeyer. She received her first eight years of schooling in a one room country school house, graduated from Humboldt High in 1941. She worked with her parents on the farm that she grew up on until 1942 when she married Leslie H. Monke, of Mount Olive, IL in St. Paul’s Lutheran Church, rural Mattoon. It was the happiest day of her life. He preceded her in death November 27, 2007. They were blessed with three loving sons; David of Lindenhurst, IL, Daryl (Diana) of Enfield, CT, and Roger of Normal, IL; two grandchildren and seven great-grandchildren. LaVonne had a strong Christian faith, which gave her strength many times when she needed help from God. She often said, “ask and you will receive”. She loved all people especially her family that she was so proud of. She will now be reunited with her loving husband of 65 years. In lieu of other expressions of sympathy, memorials may be made to St. John Lutheran Church or School. Be the first to share a memory of LaVonne.